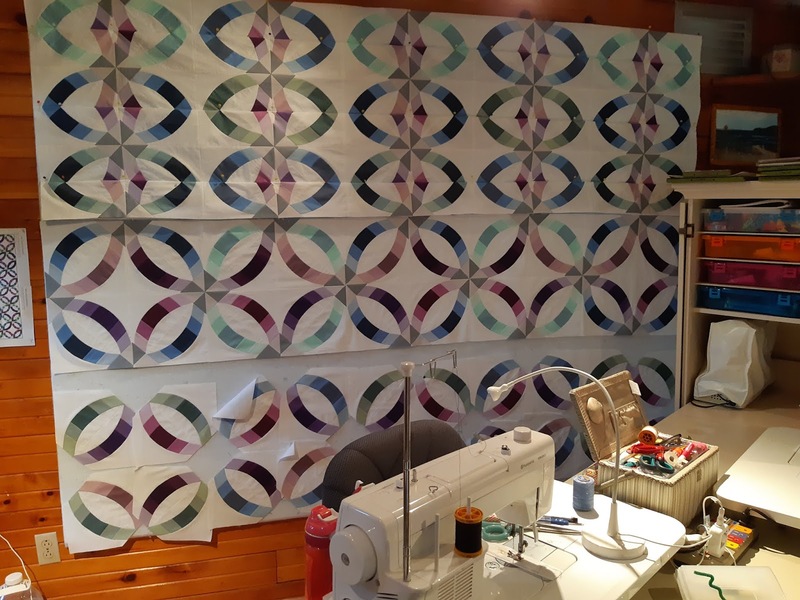 The only sewing I have been doing is working on the quilt for my daughter Ainsley and her fiance Jack. I have lots of bits and pieces sewn together and today I finished the fourth row of six rows. The first half of the quilt is accordion pleated on the top of the design wall so it takes up less room but so I can still see the layout of the coloured rings to keep me on track with the second half. All the rings for the fifth row are sewn together in pairs and just need their grey corners sewn on and then trimmed and sewn together. The rings for the final row have the background fabric sewn to them and need pressing and trimming so they can be sewn into pairs and then they will be ready for their grey corners so progress is being made. Double Wedding Ring / Metro Rings - Half Done!